"Three militants have been knocked down. The civilians, who were held hostage, have been safely evacuated. Operation is still on," Deputy Inspector General Rajouri-Poonch range Johny Willian told PTI. A policeman Rajinder Kumar was killed in the incident. Two Army jawans, two police jawans and a civilian were also injured. One of the injured is Sub Inspector of Special Operation Group Manzoor Hussain and another a civilian Tariq, police said, adding the injured have been hospitalised. The authorities used drones to track down the militants who had taken shelter inside a house where an elderly couple lived and another structure. The couple was safely evacuated. Inspector General of Police Jammu Zone Danish Rana said body of one of the militants has been recovered and others are being recovered. "The cordon in the area will remain intact till tomorrow as operation is on," Rana added. Earlier, state police chief Rajendera Kumar said, "Four militants are involved in the two encounters at two different locations." "They (militants) are in a house, where there is a civilian couple. Forces are retrieving them. We have to evacuate the civilians first," he said. The encounters started when the militants started firing from near the Mini Secretariat building, which is under construction, close to Army's 93 Brigade headquarters, police said. 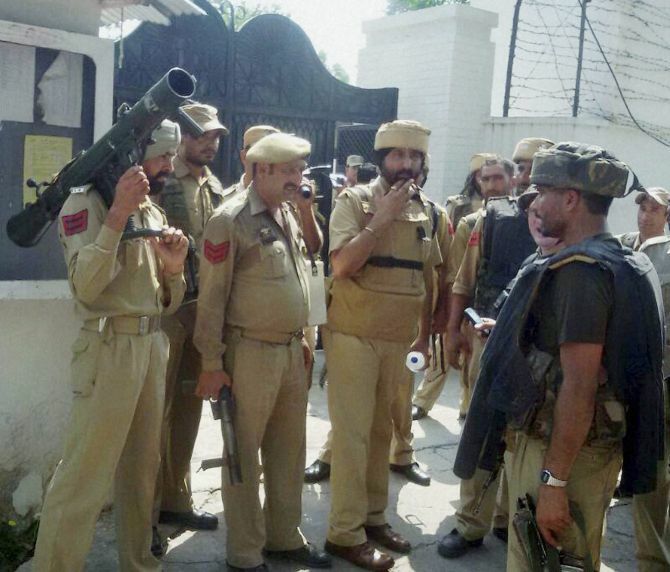 The attackers then barged into a house in Allah Pir locality and another structure near the Mini Secretariat. 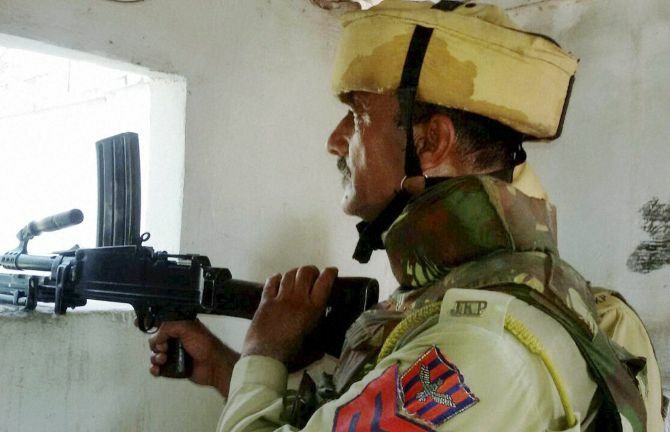 Defence spokesman said a firefight between security forces and terrorists erupted this early morning when a JKP patrol encountered terrorists on the fringes of border town of Poonch. Army units deployed in the area immediately reacted with quick reaction teams, on receiving the information, the spokesman said, adding that after initial brief exchange of fire, the terrorists took shelter in an isolated house and under construction Mini Secretariat building. "In initial exchange of fire, one police jawan was martyred and one received injuries. One civilian also got injured and has been evacuated to DistrictHospital, Poonch. The encounter is continuing and the area has been cordoned. "Efforts are on to neutralise holed up terrorists with minimum collateral damage," the spokesman said.